A private water system is typically composed of a water source, a water line, a pump, a pressurized tank, a pressure switch, and pipes to the taps in your home or cottage. The pump forces water into the pressurized water tank until it reaches a pre-determined pressure (usually between 40 and 50 pounds per square inch), at which point the pressure switch turns off the pump. The pressure in the tank is sufficient to supply the taps for some time, until the pressure falls to a certain level, at which point the pump is automatically turned on again. Your water system may also include such items as a water heater, filters, and purification equipment, but these will be dealt with later. An open body of water may be susceptible to all kinds of contamination, including coliform or faecal bacteria, protozoa, parasites, viruses, and inorganic pollutants. Thats the bad news. The good news is that you can do something about it. But first, you have to get the water to your cottage. The most common way is to run a line from a point 20 or 30 feet out into the water, weighted down along its length to keep it on the bottom. If you are using your water system in the winter, you will have to dig a trench from the shore to your cottage so that the line can be kept below the frost line. If it is not possible to dig it deep enough, you can wrap the line with an electrical heating cord, and then wrap both line and heating cord with insulation. Heating cords come with a thermostat which turns the heating on automatically when the temperature falls to freezing levels. If the level of the body of water is more than 25 feet (a pumps practical suction lift) below your cottage, you will have to put your pump closer to the water, possibly in its own heated housing. The higher your altitude above sea level, the less suction lift a pump will have. Wells run less risk of contamination than open bodies of water, with the risk lessening with depth. There are two basic types of wells, dug (or bored) wells, and drilled wells. Dug wells may be used where the water table or aquifer is fairly close to the surface, typically no more than about 9 metres (30 feet). 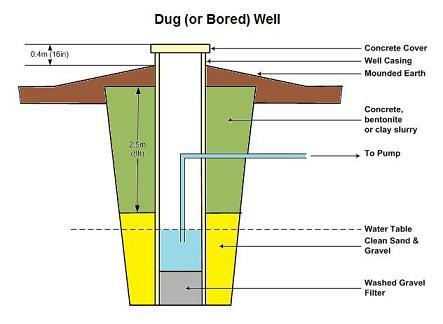 Bored wells (constructed with a boring rig rather than using construction equipment such as a back hoe) may be used for wells up to 30 metres (100 feet) deep. These types of wells have a large diameter casing of 60 to 120 centimetres (24 to 28 inches). Each jurisdiction has its own rules about the construction of dug and bored wells, and who may dig them. In Ontario, the province licenses well professionals, and you should be sure that if you are hiring someone to dig or fix your well, they are licensed to do so. Dug wells are more susceptible to contamination than bored wells, and bored wells are more susceptible than drilled wells. To avoid contamination of dug and bored wells, sealing and grouting should be used as recommended by provincial regulations to prevent surface water entering the well. In our case, we have a properly constructed dug well, but it has an old-fashioned hand pump (for winter use) installed in a hatch in the lid of the well. Unfortunately, surface water can seep into the well around the edges of the hatch, which means that water taken directly from the well usually has an unacceptable coliform bacteria count. For years, we have been trying to solve the problem of having a hand pump and sealing the well at the same time, but it appears that the two aims are incompatible. Drilled wells are less susceptible to contamination than dug or bored wells, and are generally used where the aquifer or water table is more than 30 metres (100 feet) below the surface of the ground. They are characterized by small-diameter casings of between 10 and 20 centimetres (4 to 8 inches). In Ontario, new drilled wells must conform to the requirements of provincial water regulations. Water tanks in private systems are designed partly for storing water, partly for reducing wear on the pump from on/off cycling, and partly to even out the flow to the fixtures in the home or cottage. In typical cottage water systems, the tank has to be pressurized, which means that it should be made of metal or fibreglass. Air in the tank becomes compressed as the water is pumped in, and this provides the necessary pressure to supply water to household fixtures. The pump is switched on and off by a pressure switch that responds to the pressure in the tank. Usually it is set to switch on when the pressure falls below a certain setting (e.g. 30 psi) and off when it exceeds another higher setting (e.g. 40 psi). In order to pressurize it, a certain amount of air needs to be in the tank at all times. Too much, and the pump will come on infrequently and pump longer; too little, and the pump will cycle on and off repeatedly, as it responds to the rapid rise and fall in pressure each time water is used. Simple galvanized steel tanks that do not separate air and water. Over time, the air can be absorbed into the water, and you may end up with too little air for proper pressurization, resulting in rapid on/off cycling of the pump. If you have a piston pump, the amount of air may increase over time, as these types of pumps draw in small amounts of air with each stroke and inject it into the tank with the water. Over the course of a summer season, neither the increase or loss of air may affect operation of the system, but over longer periods of time it may be necessary to take action to correct it. Unless you have some kind of air regulatory device, you may find you have to empty the tank and then refill it. Diaphragm or bladder tanks have a tough membrane separating the air and water to prevent the air from being absorbed into the water. They are pre-charged with air at the factory, but may need to have further air put in from time to time, using a tire pump or air compressor. The main advantage of these tanks is that they can be smaller than a standard tank, and still provide good constancy of pressure and flow at the taps. Click here for a useful article on bladder tanks from the Department of Health, Washington State.